Note: Tech stocks are defined as internet-related stocks plus other technology stocks, not including biotech. IPOs with an offer price below $5.00 were excluded. ADRs, unit offers, close-ended funds, REITs, natural resource limited partnerships, small best effort offers, banks and S&Ls, and stocks not listed on CRSP were not included. Dissident voices are emerging, expressing concerns over the inequity of dual class stock among tech companies – a structure wherein common stock is often split into two classes of shares, including one with preferential voting rights. In such a structure, the public float has standard voting rights (i.e., one share, one vote) while a second class of stock, the founders’ common stock, has majority or super majority voting rights (e.g., one share, ten votes). Founders will often reserve the majority voting stock to maintain control of the company post-IPO. 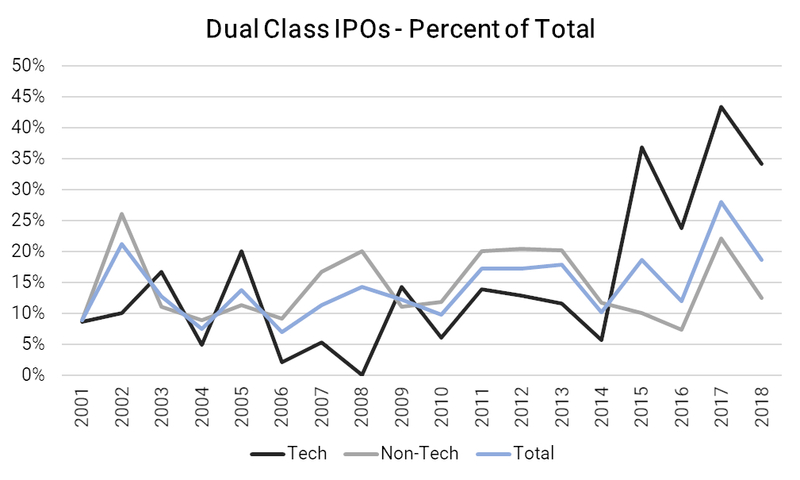 As the chart above shows, dual class stocks are not unique to tech IPOs, but in recent years, tech IPOs have seen a steep jump in the dual class structure. In 2017, 43% of tech IPOs contained dual class stocks versus 22% for non-tech. Notably, Lyft’s recent S-1 filing indicates that the company intends to list using dual class stock, giving its founders a majority voting stake. While this structure is not new or rare, the recent missteps at giant tech companies have brought increased scrutiny to this structure. In the midst of the corporate takeover heyday of the 1980s, companies sought to list dual class stock in an attempt to counteract hostile takeover attempts. Regulatory bodies and national exchanges pushed back on this movement in order to preserve strong corporate democracy and best practices in corporate governance, leading some companies to seek changes via the legal system. Ultimately, the NYSE succumbed to the pressure of corporate management, reversing its long-standing rule disallowing dual class stocks. Since the NYSE’s decision, the jury has been out on whether the rule change has been beneficial to company performance. Those against dual class stock claim that the structure fails to hold founders or senior management accountable, hurting corporate interests and shareholder returns. On the other hand, the opposing camp argues that dual class voting structures allow founders to more effectively steer the ship in turbulent times, ignoring short-term traders and prioritizing long-term goals. On balance, long-term goals should be prioritized, and seeking to please the market by meeting short-term financial targets can lead to value destruction down the line (e.g., sacrificing R&D spending for the sake of near-term performance). In cases like Google or Amazon, where majority voting share was held by the founders, Google’s Sergey Brin and Larry Page and Amazon’s Jeff Bezos pursued visionary strategies, bringing their companies to the apex of corporate America. However, it’s easy to write off the concerns raised by dual class stock critics by citing the successes of Google and Amazon (although neither has been without recent controversy). Today, critics often cite Snap and Facebook as examples of companies where dual class stocks have obstructed good corporate governance, leaving the public markets holding the bag for managerial oversights by founders. In Snap’s case, Evan Spiegel, CEO and Founder of Snapchat, has been criticized for his slow reaction to falling user numbers and his rushed overhaul of Snapchat’s user interface. In Facebook’s case, Mark Zuckerberg, CEO, Chairman & Founder, has been criticized for prioritizing growth over consumer privacy concerns and his slow response to misinformation campaigns launched by foreign actors. 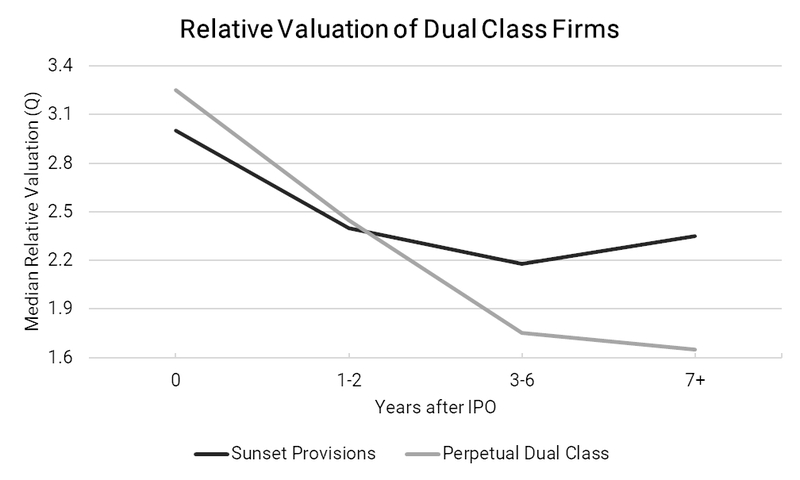 The chart shows that companies with sunset provisions experienced relative valuations in line with their perpetual dual class counterparts 1-2 years after IPO. However, 7+ years after, the two cohorts of companies experienced significant valuation disparities. Commissioner Jackson observed that those companies that dropped their dual class structures saw significant increases in valuation. The chart implies that the public markets increasingly tire of broad founder powers as shareholders welcome back stronger corporate democracy. Commissioner Jackson noted that this analysis was preliminary in nature but was meant to fuel a robust discussion. Like Commissioner Jackson, we acknowledge the complexity of the issue, and the above chart doesn’t capture the whole story. Nonetheless, it illustrates the financial benefit that sunset provisions may carry. By implementing sunset provisions, companies allow founders to pursue long-term strategies that the market may fail to appreciate at first, while preserving stronger corporate democracy later on. In cases of misguided founders, shareholders are forced to tolerate mistakes, albeit for a shorter period of time. Ultimately, management, shareholders, and lawmakers will need to weigh the pros and cons of dual class structures to determine if sunset provisions are the best path forward.